Prague combines the best of old and new. Take in cobblestone streets, castles and of course world-class beer! Upon arrival, transfer to your hotel and check-in. Today, enjoy a guided tour via comfortable motor coach. Begin in the city center to see the major sights: The National Theatre, the Powder Gate, Wenceslas and Charles Squares and the Prague Castle. Continue to the Lesser quarter and marvel at St. Nicholas Church. Next, disembark the bus and proceed with a walking tour to visit Prague Castle, then pass by the St. Vitus Cathedral, the Old Royal Palace and St. George's Basilica. Return to the motor coach and see the Jewish quarter and the Old Town during a visit to the famous Old Town Square with its Town Hall and Astronomical Clock. Today, on a private walking tour, continue exploring Prague. Walk through the Old Town, Jewish quarter and New Town and learn about Prague's fascinating history. Spend four days on your own schedule to fully explore Prague. Your two-day hop-on / hop-off pass is a great way to check out Prague's major sights. Hop on and off the bus wherever you like and take note of places you'd like to return. 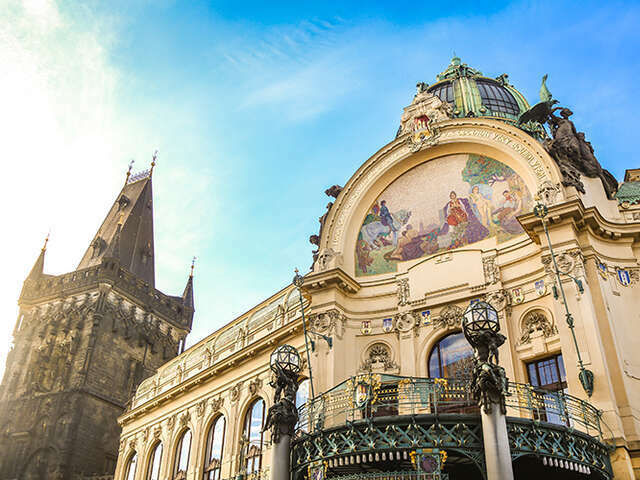 Discover Prague's wonderful cafés, museums and beautiful buildings, or grab a pint at one of Prague's many charming pubs. After breakfast, transfer to the airport and board your flight home. Departures May 30 - September 28. Contact your UNIGLOBE Travel Consultant today to book this historic trip!